No more low tiered sets and brown bags. With RealmBot you can dominate realm, fast and easy UI allows you to get to events on time. Setup your preferred events, servers and notification options and you are ready to dive in unlimited action. Shows a list of all server realm events which have started and/or ended. You can filter events you want to see and how you want to see them. RealmBot isn't only an event notifier, i'll also tell you if someone is holding an INC in his inventory! Enjoy your free Wine Cellars! 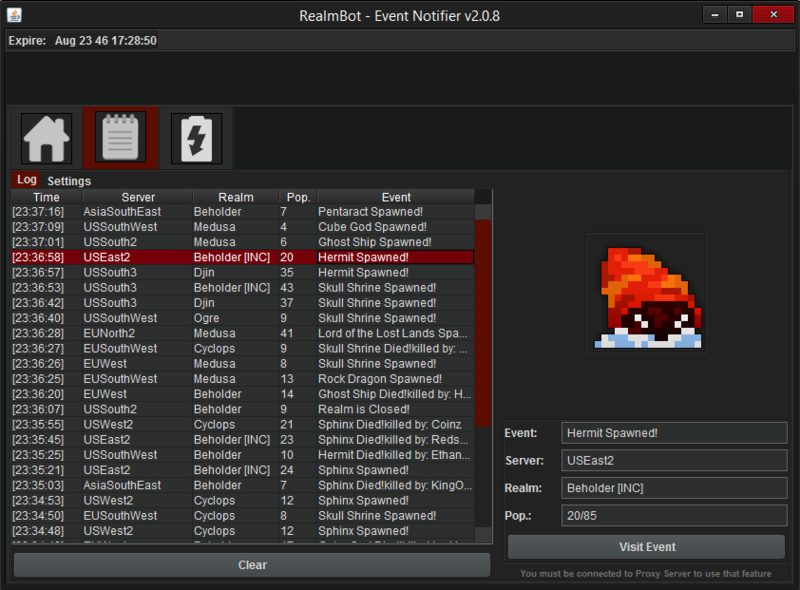 RealmBot also includes usefull modifications for RotMG like auto spell bomb, auto portal enter, easy server swap etc.